and the Origin of Species. Charles Darwin was born on February 12, 1809. When he was fifty years old, in 1859, he published On the Origin of Species, a book destined to radically change our view of the living world. In 2009, we celebrate both the bicentennial of Darwin’s birth and the 150th anniversary of the publication of his great work. Darwin began his scientific career as a naturalist, as someone who collected plant and animal specimens, studied and recorded the details of their structures, and attempted to identify and classify them. He thus worked within a framework that was known as natural history. 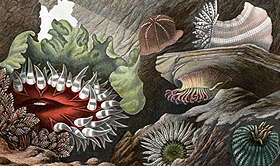 Natural history had a venerable pedigree, with its roots in Aristotle, but it especially flourished and matured in the four centuries before the Origin of Species. Darwin was the direct heir of naturalists like Konrad Gesner, who published the first illustrated encyclopedia of zoology (1551-58), Carl Linnaeus, who successfully sorted out the plant and animal kingdoms with his influential taxonomic System of Nature (1735), Joseph Banks, who sought new species in the south seas on the first voyage of Captain Cook (1768-71), and Jean Lamarck, who made the study of invertebrates a respectable branch of zoology (1801). The Grandeur of Life is held in copyright by the Linda Hall Library, and any reproduction of text or images requires permission. The Grandeur of Life was made possible by a generous grant from the Victor E. Speas Foundation, Bank of America, Trustee and was on display at the Linda Hall Library from October 1, 2009 to March 27, 2010. More.